Conversely, when they are only a few active listings because a large number of homes have sold, the seller has the advantage. When demand outstrips supply, prices usually rise. The three-year graphs below for the Redmond home sales 98052 Zip Code keeps you informed about the Redmond market trend. Come back monthly for all the current Seattle area market trends. 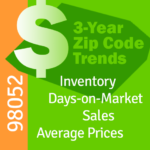 For home sales trends in Redmond ZIP Code 98053 click here.